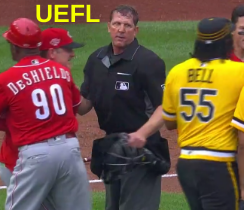 HP Umpire Jeff Kellogg ejected Reds Manager David Bell (arguing warnings), RF Yasiel Puig and pitcher Amir Garrett (fighting); and Pirates P Keone Kela and P Felipe Vasquez (fighting) in the top of the 4th inning of the Reds-Pirates game. With none out and one on (R1) in the top of the 2nd inning, Reds batter Derek Dietrich hit a home run. His next time at-bat, with none out and none on in the top of the 4th, Dietrich took a first-pitch fastball from Pirates pitcher Chris Archer for a called ball. Replays indicate Dietrich appeared to "admire" his home run in the second inning and that the 0-0 pitch to Dietrich in the fourth inning was thrown behind Dietrich's back and hip-high, resulting in warnings, the call was irrecusable. At the time of the ejections, the Reds were leading, 3-2. The Pirates ultimately won the contest, 7-5. These are Jeff Kellogg (8)'s first through fifth ejections of the 2019 MLB regular season. Jeff Kellogg now has 9 points in the UEFL Standings (-1 Prev + 5*[2 MLB + 0 Irrecusable] = 10). Crew Chief Jeff Kellogg now has 7 points in Crew Division (2 Previous + 5 Irrecusable Calls = 7). These are the ninth, 10th, 11th, 12th, and 13th ejection reports of the 2019 MLB regular season. These are the sixth, seventh, eighth, and ninth player ejections of 2019. This is the third Manager ejection of 2019. Prior to ejection, Puig was 0-2 in the contest and none of the other players had participated. This is Cincinnati's 2/3/4th ejection of 2019, 1st in the NL Central (CIN 4; PIT 2; MIL, STL 1; CHC 0). This is Pittsburgh's 1/2nd ejection of 2019, 2nd in the NL Central (CIN 4; PIT 2; MIL, STL 1; CHC 0). This is Yasiel Puig's first ejection since August 14, 2018 (Eric Cooper; QOC = U [Fighting]). This is Amir Garrett's first career MLB ejection. This is David Bell's first ejection since September 26, 2016 (Tim Tschida; QOC = U [Balls/Strikes]). This is Keon Kela's first career MLB ejection. This is Felipe Vasquez's first career MLB ejection. This is Jeff Kellogg's first ejection since June 16, 2017 (Joe Maddon; QOC = Y-C [Replay Review]).